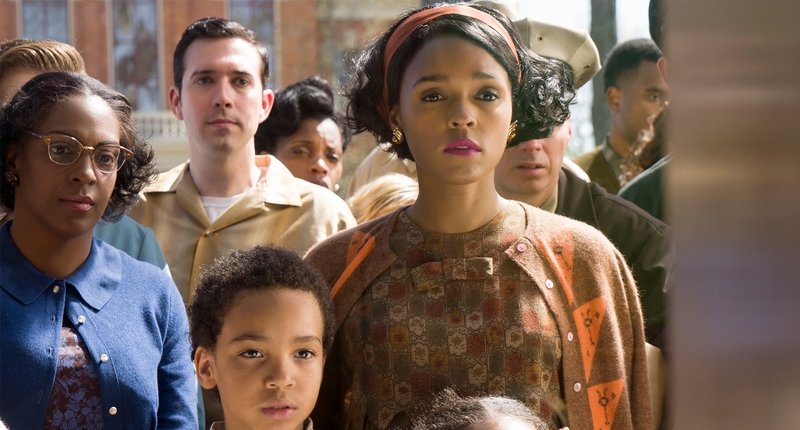 There is little doubt that Hidden Figures, directed by Theodore Melfi, was shot with the intention to be a crowd pleaser and it succeeds greatly in that mission. Like the films core three characters, the film is injected with a riveting sense of hope, promise and the urgency of dreams, be them big or small in scale. Based on the true events of three African-American women Katherine G. Johnson, Dorothy Vaughn and Mary Jackson (here played by Taraji P. Henson, Octavia Spencer and Janelle Monae) who were crucial in NASA for launching one of the first successful space missions. Their story, until now, has unfortunately unsurprisingly gone under-noticed and Hidden Figures is as good as any biopic in showcasing not only how vital their efforts were in the past for scientific discovery, but also why their stories are crucial today for a large audience to watch and consume. There is very little here on paper here that goes beyond what we’ve come to expect from a biopic, particularly one with characters considered underdogs at the center. The characters face adversary, make unlikely friends and with their talents demonstrate their significance and overcome the prejudice facing them for unmitigated success. Where the storyline defers from the norm is the story itself. Putting not just three women scientists, but three women of color scientists front and center of an inspiring, life affirming tale isn’t often seen in film and with stories such as theirs, it makes it only more confounding why not. Like good underdog stories, Hidden Figures taps into the part of the viewer who wants everything to work out, who wants Dorothy to get the recognition she so obviously deserves, for Mary to be allowed to study and follow a career path the same way a white male is gifted with and for Katherine to get the big, cinematic “a-ha” moment where those around her finally realize her intellect, her genius, and she gets the big, sweeping happy ending. Since history doesn’t come with spoiler warnings, it’s easy enough to state that these moments do come-with a showstopping moment from Henson when she lays into her male peers about the absurdity of the difficulties she faces every day just to do her job and be treated as a human being-and the road to those key moments are hard won for the characters and well earned for the film. These scenes of triumph are played so effectively largely in part due to a deft script by Melfi and Allison Schroeder which highlights both the political and personal lives of Katherine, Dorothy and Mary and make sure to give special notice to how the three support and play off of one another. We aren’t just watching historical figures, but women who seem real and feel tangible, who viewers, young girls especially, can look to and see familiarity, women to strive to be. The film is determined to not paint them to be saints, just women with huge amounts of intellect who were short changed and sidelined for a large part of their lives due to their gender and race. Henson is captivating in the leading role, playing soft spoken and self-conscious and then transitioning to confident and eloquent in the blink of an eye. There’s an underlying, bubbling passion that sparks when she delivers her lines that bring Katherine, already so alive with the script alone, to a further electric charisma. Spencer, as we’ve come to expect (and in that vein, tend to under-appreciate) is equally as good, toeing the line of warm mentor and ambitious with ease. However, despite the earned accolades the other two are recieving, it might be Monae who impresses most. With this and a supporting turn in the transcendent Moonlight, Monae has proven that she’s a skilled actress and Hollywood should take note. She lights up the screen effortlessly, cause the viewers to want to know about her by the time the film has ended. While lacking in the visual department in terms of direction, with a rather static eye behind the camera, the film regardless is a feast for the eyes with its costuming and styling, bringing the viewers further into this world. Not to be ignored of course, is the timely nature of the films release. When we’ve lived through a year such as 2016 when freedom and liberty has been so flippantly threatened, we need a reminder of these underdog stories, of these three women who so valiantly changed the course of history. It makes our eyes wander and our ears perk, always on the look out for those who may next pioneer us into greater, undiscovered territories. Hidden Figures is out now. Previous ArticleThe Shins announce new album "Heartworms"